In response to a call made by supporters of ousted president Mohamed Morsi to demonstrate Sunday, security forces have sealed off Cairo and Giza’s main squares that had been spots for protests including Tahrir Square, downtown, Giza’s El-Nahda Square, Nasr City’s Rabaa Al-Adawiya and Mohandesen’s Mostafa Mahmoud Square. Traffic flow, as a result, has been affected. The 6 October Bridge, the 15 May Bridge and Qasr Al-Nil Bridge are jammed as cars have been redirected from the blocked squares, reported Al-Ahram Arabic website. A pro-Morsi coalition has called for protests at the location of two sit-ins that were violently dispersed by security forces 14 August, leaving over 600 dead. The announcement was made on the website of the Freedom and Justice Party newspaper, a Muslim Brotherhood mouthpiece. Morsi supporters also took the streets Friday marking 100 days since the dispersal of the two pro-Morsi sit-ins. 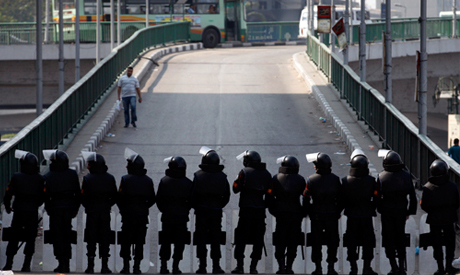 Clashes followed in several parts of Egypt. Now these Nazis are banning all the protests. 4 months ago they were not even on the street for stopping the violence.